1. The closed glass Pasteur pipette, making use of broken ones, acts like a miniature test tube. 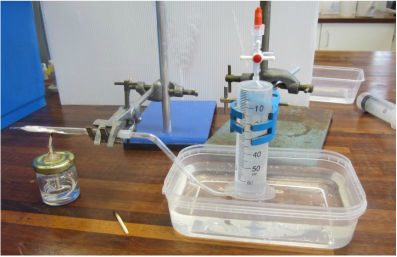 In the pipette is placed the plastic (0.1 to 0.2g), a small mineral wool plug and the loosely-filling aluminium oxide powder which acts as a surface for the reaction and create a large surface area. 2. The gas is collected in a 60 ml syringe. The syringe is filled by attaching a 3-way tap with another syringe to fill up the barrel with water. The tap is no closed but the techniques can used to draw the gas off when required. The volume markings on the barrel can be used to to work out the yield of gas. The gas can be tested with 0.002M bromine water and 0.002M potassium manganate(VII) solution. A gases burn with yellow smoky flames; attach a Pasteur pipette to the syringe and ignite the gas as you push the gas through the syringe. The iron sulfur reaction has caused several incidents with too much sulfur being placed in the test tube and on heating it boils out of the test tube and burns to form toxic sulfur dioxide. Keeping the mass down to 2g for a demo and 0.2g for a student experiment with a plugged test tube work well. I have always found the product magnetic, despite what text books say. This could be due to unreacted iron, iron trapped in the iron/sulfur crystal lattice (an interstitial compound) or the fomation of magnetic Fe3S4. The other problem is reacting the compound with acid produces toxic hydrogen sulfide which has a n intense odour of bad eggs but humans produce it as well. Microscale methods can be useful to handle this gas. 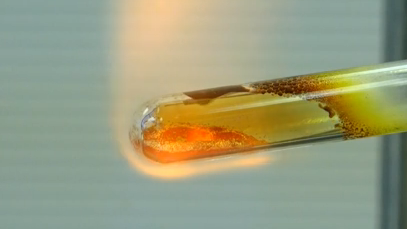 This activity explains how copper(II) oxide can be safely reduced to copper with hydrogen. Water is seen at the end of the Pasteur pipette. The large scale version caused an incident that lead to the prosecution of a teacher by the UK Health and Safety Executive. The drying-bottle containing concentrated sulphuric(VI) acid used to dry the hydrogen, exploded as the unused hydrogen was ignited. Many teachers stopped doing this demonstration. Alternative suggestions such as using methane or including ethanol in the system complicated the chemistry so that students did not know what was going on. See https://www.youtube.com/watch?v=b9UF6wycia8. This is a very important demonstration to help the understanding chemistry. It has normally carried out with lead bromide but anhydrous zinc chloride works as well but without the colour of the bromine to indicate the formation of the element at the anode. The large scale version takes a long time to obtain a result and has to be carried out in a fume cupboard. However, with such small amounts used, I have carried out the procedure on the open bench and never detected the bromine other than by colour. 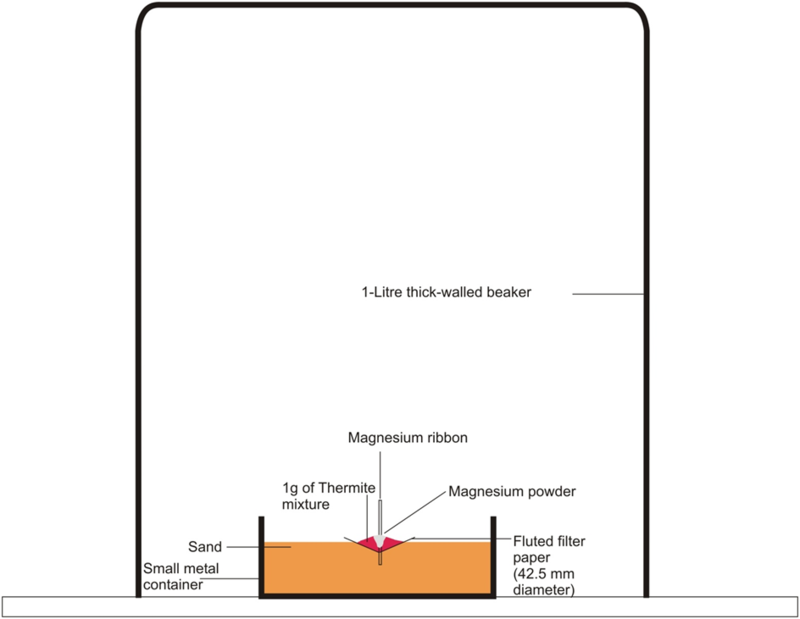 This microscale procedures requires 7mm medium wall borosilicate glass tubing. See https://www.youtube.com/watch?v=LwwmRP8Zpaw. The traditional procedure used boiling 6M sodium hydroxide in a beaker. The test tube contains solid sodium hydroxide which cannot be touched by the student. Using less than 1 g of Thermite mixture, some ignite powder and a magnesium food, this event is prepared and over in less than a few minutes. 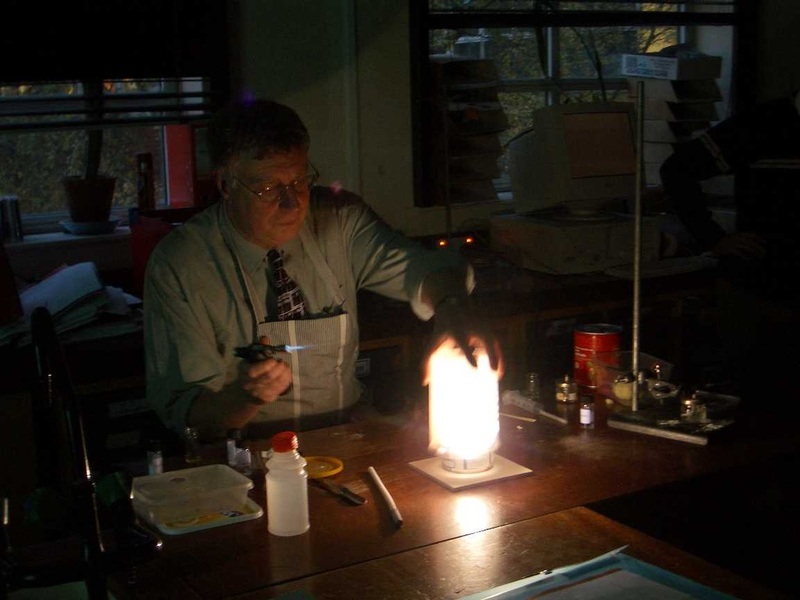 The smoke is contained in the 1 litre beaker which is placed over the reaction so that no fire alarms are activated. 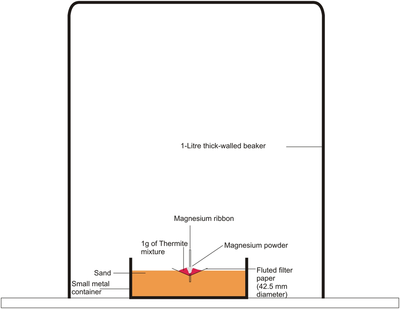 With a magnet, the iron can be extracted from the small tin of sand used to house the reaction.